I have to admit, I'm a sucker for stories of this kind, stories of how ordinary people conquer difficulties in their lives to achieve the goals they hunger for. 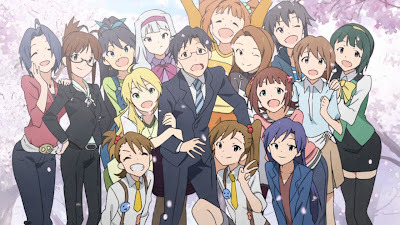 The anime itself is really just a series of life stories of a group of girls who wants to become idols. It's based on the game with same title where you would play the role of producer to help this group of youngsters to resolve their problems and achieve their goals in life. I've never played the game, but I think if I did, I'd probably like it equally as much. On the surface, it may look speciously like a harem anime. In a way, it kind of is. But instead of focusing on the relationship development, its primary focus is on character development. That actually changes the overall feel of the story quite a bit. Recommendation: I think this series might strike many as too formulaic. In a sense it is, but that does not take away how well the story is. In my opinion, if you like to see a good ordinary people in a ordinary anime, this is definitely among the top picks from 2011.